WiFi Hooking to Realm of Origin Successful. Begin Transmission. Hello and welcome! You are now talking to someone who is straddling the line between Realms. What are "Realms" you ask? Post and find out! BUT SEEING AS HOW *I* WAS THE FIRST TRAVELLER OF REALMS, THEY'RE WRONG, DAMMIT!! Anyway, say Hi, start a convo, whatevs. I'm good here. Time doesn't pass here in The Empty, so my battery won't die and I won't age. HMU, humans! Re: WiFi Hooking to Realm of Origin Successful. Begin Transmission. Same, glad to be here. Been lurking since comic 3000-ish. Now, what about my "Lug Wrench"?? ...oh, I see you've already met Miss Powers' associate from New Zealand. 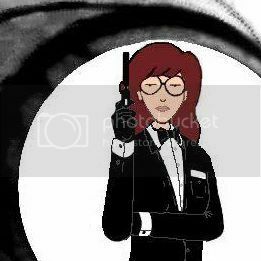 Miss Melody Powers, Secret Agent. Ah, I see. That was funny, but I'm still a little confused. Plus, I've never watched Daria. My Avatar is from a Daria Fan Fic artwork. Supposedly,it's a Jane Lane painting she did for Daria as a celebration of Darias first published Melody Powers novel. Here's a better image of it. Hmm, neat! But what's the whole " **Melts Your Lug Wrench** " thing about? It's become something of a running gag I inadvertently started a couple of years ago. I'd just been watching Starman when I lifted the quote from the Movie as a greeting in here and it sorta went from there. OHHHH, NOOOOOOOOOOOOOOOOOO!!! NOT MY LUG WRENCH!!! !